AS THE TITLE SAYS . 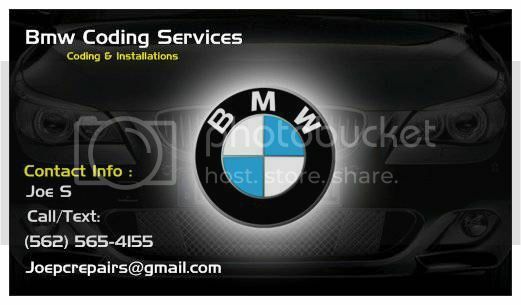 IF YOU NEED ANY CODING DONE TO YOUR CAR CALL OR TEXT ME. I DO REPLY FASTER ON TEXT MSGS.. 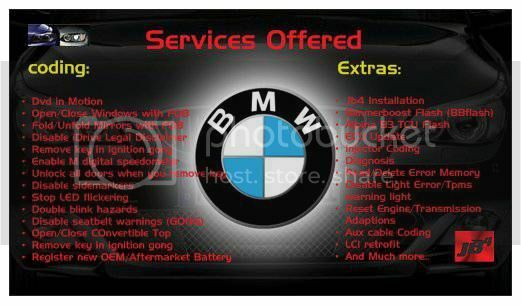 I CAN CODE ANY BMW ANY YEAR/MODEL. Here's some of the coding features that can be done. this is only some of them. but theres more. Wipers full swipes to end position when engine is turned off. Note: This feature will only work when the auto wipers are on, once it closes you wont be able to re-open the sunroof until car powers down for about 10 minutes. Note: Video in motion is applicable to CIC Navigation only. Last edited by joselarajan87; 09-20-2016 at 02:47 AM..